If you are local to the Boulder/Denver area, chances are good you have heard of, or know, Caroline Douglas. Her whimsical and dream-based ceramic sculptures are prevalent in exhibitions in this area as well as further afield. She also is a beloved teacher in Boulder and also in Marrakesh, Mexico and Hawaii. Some of her more recent travels have taken her to Estonia, Serbia, and Latvia where she made her clay sculptures in the company of sculptors from Turkey, Egypt and Croatia. Welcome Caroline! I’ve known you for years but am excited to hear and share more about your creative journey! To start, could you give us a short version of your background - did you go to art school, where did you grow up, what brought you to Colorado/Boulder? I grew up in Asheville NC and went to the University of North Carolina and got a degree in ceramics. I then studied at different schools in the grad departments and spent a lot of time at Penland school of Crafts in North Carolina. I had a boyfriend who had lived in Colorado and raved about it so we moved here. I loved Boulder and have been here for 42 years! It inspired me so much with the big sky and picturesque mountain range at the city’s edge. A group of Caroline’s porcelain sculptures. Has living in Boulder impacted your artwork and how? Living in Boulder has been the perfect place to raise my children. And the beautiful scenery has been an inspiration! I was first moved by the huge blue skies. What was your first call to travel and where did it take you? I grew up taking long car trips with my family and I still love to travel! So do my 2 brothers. Every summer we would travel somewhere special… out west, to New Orleans, to Canada and Mexico. I spent my 19th birthday in France and traveled alone through 9 different countries after studying at the American School in Paris. How do you feel your art and travel are related - do they feed each other? I am fed by travel in many ways. Travel makes me so creative and I am inspired by all the new and different sights and sounds and smells and tastes. I am out of my regular routine and engage with the world in fresh ways. It isn’t always apparent in my work but I am fed by all these new visuals and they end up in different ways in my dreams or my work. I know many years ago you had a terrible accident that changed the course of your life and your work. Can you tell us more about that? Yes I had a severe head injury and it took about 10 years before I was back to feeling myself again. But after having to relearn how to talk and walk without fainting many times a day, I started having dreams of pieces that needed to be made in clay. They were mostly women and animals together in some way. Luckily I already was a clay artist and was able to little by little, be able to make them. They astounded me and I feel the making of the clay is what healed my brain. The neurologist I saw wrote a book about how one artist transformed her life through the use of the alternative healing method of clay. Recently there has been much research that verifies this. You often talk about healing through art, and I know you also work with others intuitively through palm readings etc. How did that come to be? After my head injury I was very psychic and saw things about and around people. I decided to study scientific hand reading so as not to appear too out there. It has been so fascinating for me to give others a reading about their life purpose and life lesson which you can see in the hands. I love this as a healing tool to aid others in having more awareness about who they are and what might be directions for them. I was honored that you yourself had a hand reading! Can you say how it impacted you and your work? What motivates you as an artist? Is there an overarching theme to your work and practice? I love working with my hands and creating ideas from nothing. That has always captivated me since childhood when I made doll clothes and volcanoes that spewed fake lava~ I am satisfied on a deep level as time stands still and I realize I have been in the zone for hours! I work a lot when I am home. I work a lot when I am teaching too! The word I hear most from people is prolific. That is what I tell my students….that the most important thing they can do for their art is to show up. .. to commit to working with their medium every day or as much as possible…that’s when and where the magic happens. I know teaching is a large part of your art life. What is your approach to teaching and what are you hoping to pass on to your students? And how do the exotic locations affect the work people do? My approach to teaching is to inspire the students, to get them excited and passionate about creating as much as I am. As they begin to feel the excitement and satisfaction of creating something from a piece of clay, they are alive! I love seeing that. I think the best I can do is to show the students how I show up for my work and hope to inspire them to do the same. As a professional artist - how have you juggled family, making a living, and travel? When my children were small, my husband was traveling and getting his career under way. I stayed home and played with my kids. We made toys and gnome houses and had a season table for every season.. I loved it! Then once they were older, I started back more full time with my pottery. Then after my head injury, I felt a sense of urgency to create in clay every day. Travel came naturally. I was invited places and realized it was something I wanted to add into my life again. You have been traveling a lot these past few years in particular. Tell us some of the interesting places you’ve been to and how you practice your art while on the road, especially because ceramic is a very studio dependent art practice. Yes ceramics needs a studio and equipment. I was first invited to make work in Marrakech, Morocco for a beautiful hotel where I brought 5 of my students and we worked in the only clay studio in Marrakech back in those days and made pieces for her collection. I have been back almost every year to teach in Marrakech. It is a magical culture and I always feel so alive there. I have been invited to teach in Puerto Vallarta at a beautiful retreat called Hacienda Mosaico. It has an outdoor studio with a kiln. I have taught in various cities in Mexico, always with a kiln and equipment. I just returned from a clay Symposium in Latvia. I was there last year as well and I love the interaction with other artists from around the world. In Serbia, I worked with other artists from Turkey and Egypt and Croatia with the local clay, building sculptures in the traditional turn key way on an ancient style wheel on the ground. The clay was dug up from a huge cave that sheltered folks during the war, then it was mixed with calcite ( similar to quartz crystal) and then stomped on with our feet. It was fascinating and informative. Great fun working on these projects with similar minded artists. Have you ever been to an artist residency, and do you have any thoughts about them? Yes I did a residency at Red Lodge Clay Center in Montana which was amazing! I shared a big studio with 3 other clay artists and we had a blast experimenting and playing with different techniques, glazes and firings. Plus we got to stay in a cute bungalow where we had deer and bear visitors daily. Visiting the national parks around there was a gift in itself! Do you have any further thoughts on art and travel you’d like to share? I encourage other artists to travel for a workshop or a residency to explore new ways of making your art, and to get yourself out of your normal routine. I can see with different eyes and my work has a new level of joy in it. If you like to travel and love to create things, it is a great way to combine both loves. i want to know more about artist residencies! 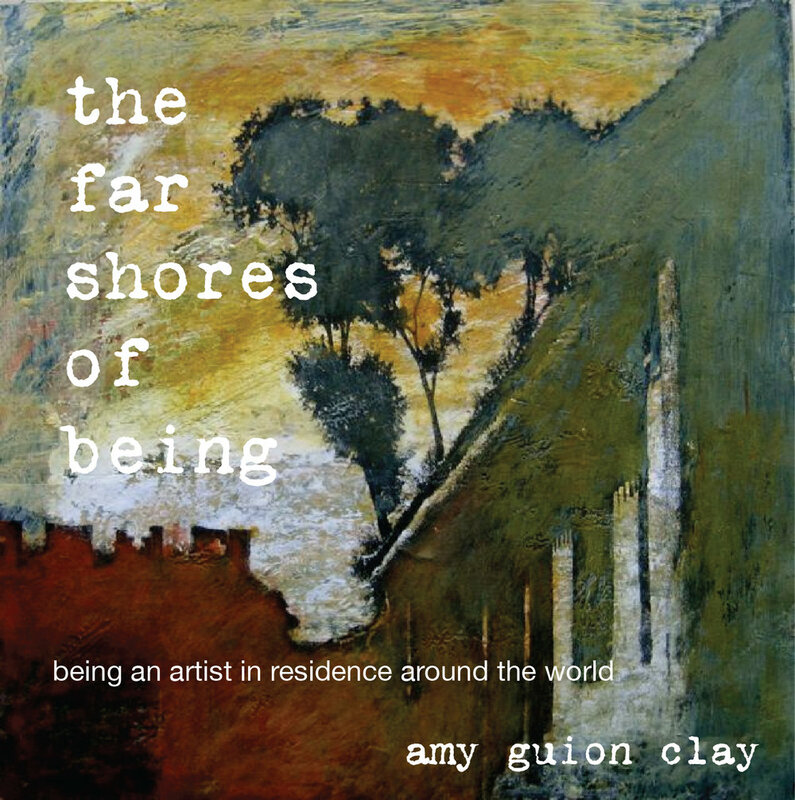 For a limited time I am offering my eBook, The Far Shores of Being as a FREE download. This was a labor of love chronicling my first 2 years of artist residency adventures. 32 pages of photos, artwork, stories and mishaps - from France to Turkey, India and New Zealand. Sign up for your link to the download. Enjoy! Subscribe to get your free Ebook and updates!